The Earth Issue is a collective of environmental artists. Disbanding the idea that eco-friendliness means hemp trousers, matted beards and (God forbid) poi once and for all is The Earth Issue, a collective of artists and creatives that align art and environmentalism through exhibitions, talks, collaborative projects and publications (printed on 100-per-cent recycled paper with soy-based and vegetable inks, of course). Their raison d’être – to create from a place “in harmony with nature without having to disregard your creative freedom” – chimes beautifully with the broader ideas around the Stella McCartney Loop sneakers, which are created using materials and processes which mean that every component is recyclable. 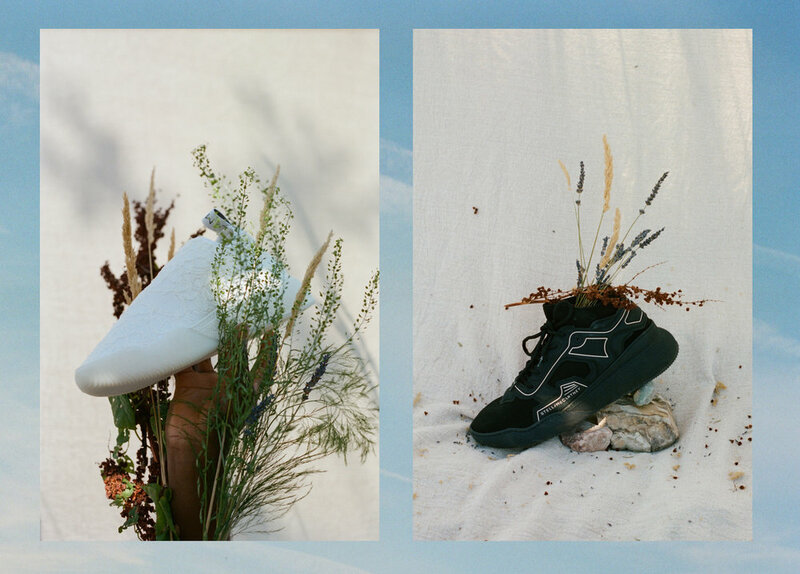 “If you’re going to make a shoe, something physical that people can ‘engage’ with, be a part of and wear – make it as sustainably as possible,” says The Earth Issue founder and creative director Elena Cremona, who created a series of images inspired by the trainers with stylist Isabelle Landicho. “Ethical fashion has a bad rep aesthetically,” Landicho continues. “What Stella McCartney has done with the Loop Sneaker and with her brand is make sustainability cool.” Here, as immersive new space The Loop Lab opens at Stella McCartney’s Bond Street store in order to further investigate the new style’s innovative construction, Cremona and Landicho talk to us about balancing the urban and the natural, how to enjoy fashion ethically, and why we shouldn’t take life “so bloody serious”. Isabelle Landicho: “The business model we are operating in is flawed: we’re working in a cradle-to-grave structure which has huge environmental implications. We need to introduce a circular economy – a regenerative system in which resources are reused and restored by design, thus decreasing negative impacts. The Loop sneaker is definitely a product that adopts the spirit of circular design and slow fashion at its core; taking 18 months to think up, it’s a beautiful shoe and the first of its kind. The Loop sneaker is available now. Sign up with your email address to receive news and updates from The Earth Issue. We respect your privacy. The information you supply us is private and will not be sold-on or misused.